Following examples will help you a clear out understanding of Gate Level Modelling of Verilog. 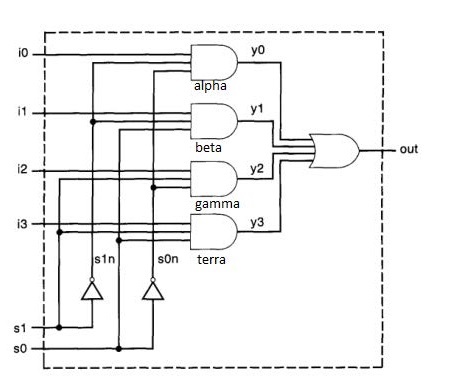 The key idea in Verilog or any hardware designing is to think in blocks and to write a separate code for each block. This idea will become clearer once we get the hang of Hierarchical style coding. 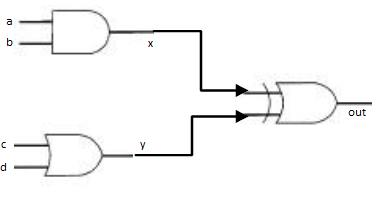 By observing the above waveform we can clearly observe that if all inputs ‘a,b,c,d’ goes to 0 the output is 0 otherwise it will be high as one of the input remains high which is the correct working of OR gate. In the problem given above we can clearly see that inputs ‘a,b’ are ‘ANDed’ and ‘x’ is the output and input ‘c,d’ are ‘OR’ together with the result in ‘y’. Lastly, ‘x’ and ‘y’ are passed through ‘XOR’ gate with final output in ‘out’. You can also verify the design by writing the output expression and verifying it using the truth table. The above result shows the simulated results for selective inputs as given in test bench code. As we can see in the above result when switches (s0 = 0) and (s1=1) the output should be i3 which it is. You can try implementing the above code in Modelsim and try with your own set of inputs. These three examples will help you clear out the idea of gate level modelling using Verilog. If you have any confusion or questions please write in a comment section.